The city of Eleusis, now known as Elefsina, a city between Athens and Corinth, was built around the sanctuary and temple of Demeter, the goddess of crops, which dated back to Mycenaean times. In the classical period the city was the site of the Eleusian Festival when thousands of pilgrims walked the sacred way from the Acropolis to be indoctrinated into the ancient mysteries. To divulge the secret of the Eleusinian Mysteries was punishable by death and for 1400 years these secrets were known only to the initiates. The site was the second most important in ancient Greece, after Delphi. The story of the temple of Demeter at Eleusis is known to most people interested in Greek mythology and explains the changing of the seasons. Hades, the god of the underworld fell in love with Persephone, the daughter of Demeter, the goddess of wheat and fertility. Persephone’s father was Zeus who also happened to be her mother’s brother. While Persephone was picking flowers one day near Eleusis, Hades nabbed her and carried her away to the underworld. 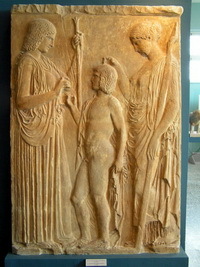 Demeter searched everywhere and could not find her daughter. Finally she came to Eleusis disguised as an old woman and meets the daughters of King Celeus who see her sadness and take her in to meet their mother, Mataniera. In return for their hospitality Demeter agrees to raise Mataniera’s new born son Demophon who grew strong, healthy and god-like under her care. One night Mataniera snuck up on the still disguised Demeter to see what she was doing that was making the boy so extraordinary. She peeked in as Demeter was passing her son over a fire. Mataniera cried out in fear. The startled Demeter was furious, (if a God can be startled) and revealed herself as the goddess and told Mataniera had she not interfered, her son would have been immortal. She then commanded the people of Eleusis to build a temple where she would reside and teach them the rites to perform and thus win her favor.